I am going to jump into stash enhancements...but be sure to stay with me till the end as you do not want to miss Celeste's, Cataleya's and Antonio's Halloween costumes they wore last Monday! "no!!!!! dont!!!!! I just bought you one for Christmas.....I hate you!" Oh well, so much for a Christmas present....but it was meant to be because there was no way I could have waited till Christmas to use mine....so it is best that I just gave it to her early. She loves it and I am thrilled that she loves it (and she knows I do not hate her)!!! Oh, and the totes were wrapped with orange tissue paper...it was like the lady knew me....LOL! Then, I got some more of my Instagram Prizes from Susan at Desert Vista Dyeworks....I got 10 mini skeins and a Sweet Pea Pod.....I only have 2 more prizes to get and that is a DVD tote and a skein of DVD yarn....Yahoo!!! Thank You Susan for all your generosity! 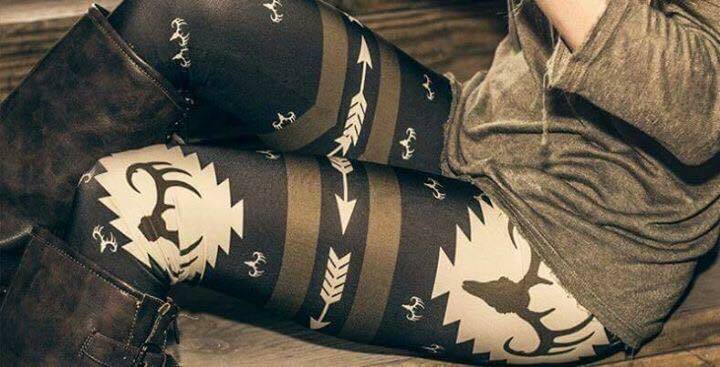 Oh, and since I am a leggings junkie....I got some new ones. These are especially for Hunting Season and I wore them all weekend and plan on wearing them most of next weekend :) they are super comfy! 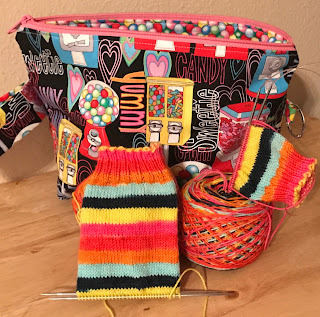 Well, since this is a knitting blog....let me get on to the knitting. So, over the past couple of weeks I have tried to knit on only 3 (sometimes only 2) things....and while it does help get progress done on those things you are working on....I feel like I have less and less to show here on my blog. Then I started my November Socks.....I finished my October socks on 10/17 and cast on my November socks 11/5...that is 18 of no sock knitting and I really, really missed it. I had other socks to knit on, I just didn't...and when I cast these on, I realized how much I missed knitting socks! Then....Darlene struck again! She has been thinking of doing a crocheted chevron blanket with bulky yarn....well, we all know that I have to be like her and she has to be like me and we have to do what the other one is doing....LOL! So, I thought I would try to make one too...this will be for Antonio because he just loves anything I make for him....I had this yarn at home to start with, but I have some more coming from Knit Picks...it is Brava Bulky held double and a size P hook....you can see I messed up on the red a couple of times. Oh, and I almost forgot to mention that I won some yarn! Yup....on IG with my friend Mary....we are each getting 5 skeins of Zealana Performa RIMU DK yarn.......I am so excited...Mary texted me this morning and the package is already in SA! Well, that is all I have....I hope to have more for you next week since I will be at the lease with Jaime from Thursday to Sunday! Here are those promised Halloween pictures along with one fun knitting picture! This is Celeste with Paige's new boyfriend Chris (yes, he last boyfriend's name was Chris too): Chris has known Celeste since she was born because he is great friends with Erich. And here is the one of the pictures she took (flip screened of course)!